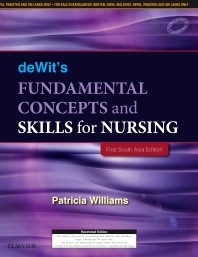 Fundamental Concepts and Skills for Nursing, First South Asia Edition provides all the basic theoretical and applied knowledge that the LPN/LVN nurse needs to practice in an expanded number of care settings, such as the community clinic, physician’s office, long-term care facility, home, and acute-care hospital setting. With an extensive art program and thorough discussion of QSEN, this text addresses topics like the physical and psychosocial needs of the patient, critical thinking for problem solving and clinical judgment, and communication — all within a strong nursing process framework. The accessible, friendly, and clear writing style appeals to students and instructors, and its rich ancillary package, including NCLEX-PN® review questions, gives students an edge on learning fundamentals. Easy-to-follow reading level and text organization presents information from simple to most complex, making it perfect for lower level students and those speaking English as a second language. Standard LPN Threads features include helpful characteristics such as full-color design, key terms, numbered objectives, key points, critical thinking questions, critical thinking activities, glossary, and references.